Penrhyncoch or Penrhyn-Coch is a small village North East of Aberystwyth. 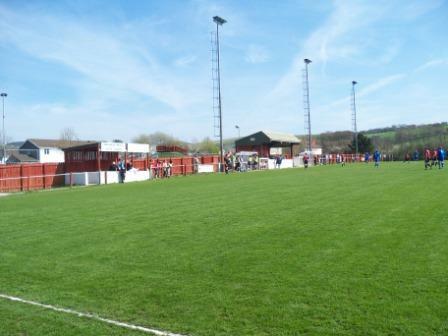 So small, in fact, that if everybody in the village turned up at Cae Baker for a home game the attendance would be 1,037 minus players, officials etc. 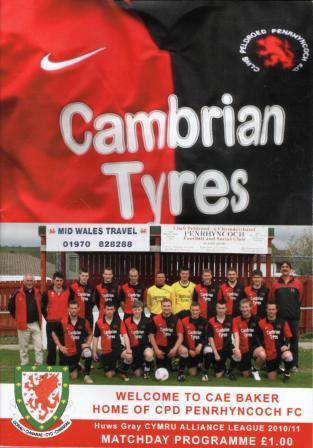 Despite its size it is an established club in the Welsh second tier Cymru Alliance, and they finished 5th in 2009-10, their highest ever placing. 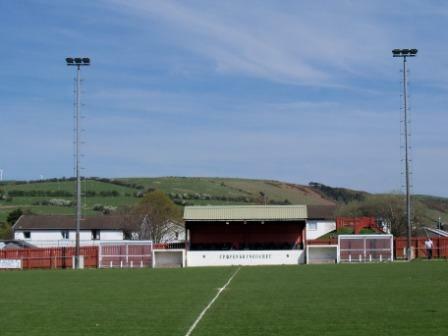 They were founded in 1965 and have always played at their picturesque Cae Baker ground. 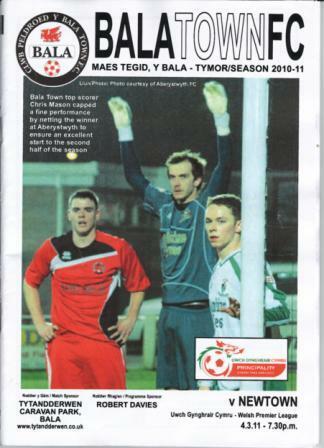 A family holiday had fortuitously aligned with an Aberystwyth double header. Penrhyncoch on the Saturday, only a small diversion on our way to Penuwch, with Aberystwyth Town on the Sunday (we were going there anyway by an amazing coincidence, so sloping off to Park Avenue was very easy). It was a impeccable day for football, one only normally experienced in August; it was t-shirt warm, very bright and windless, showcasing Cae Baker’s panoramic views of the Welsh countryside to it’s maximum beauty. If ever there was a game where you could put up with a 0-0 scoreline then this was it. The result only a minor blip on an otherwise superb afternoon. Penrhycoch were not doing as well as last year in the league, lying between the middle and bottom, whereas Welshpool’s season had been an unmitigated disaster, not helped by a massive points deduction. However, Welshpool’s fighting spirit is to be admired as they surprised the home crowd, with a good performance which should really have got them three points. They had the best chances of the game, which as 0-0s go, wasn’t too bad. I was welcomed at the ground with charming cordiality, spotted as a hopper immediately by a man at the gate. He and his two friends had a lot to do with the club and village and I got a very interesting potted history of the area and the club. Their company was excellent. Apparently, the players are mostly local despite the size of the place and the general area has the highest disparity between average wages and house prices in the United Kingdom. The ground is small, as you would expect, but smart and well kept, belying its 46 years. There is one main small stand and smaller covered bit of terrace down the same side. The rest is hard standing round a perimeter fence. Like a lot of Welsh grounds it’s the views that make it. 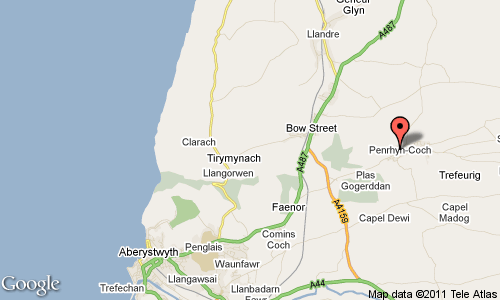 Rolling hills surround the village of Penrhyncoch, making for a very aesthetically pleasing, peaceful venue. Once again Welsh football provides a classic, not on the pitch so much today, but as a way to spend a couple of hours on a Saturday afternoon, unparalleled and very cheap. A must for all hoppers. 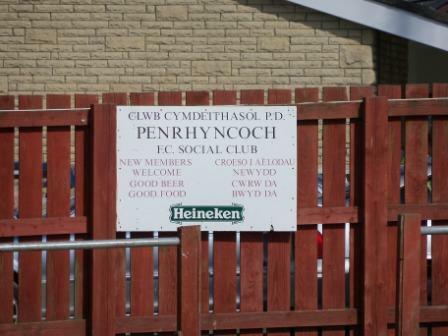 This entry was posted in Groundhopping, Travelog, Welsh football and tagged cae baker, cymru alliance, penrhyncoch, penrhyncoch fc, Technogroup Welshpool, Welshpool FC. Bookmark the permalink. Hi there. Thanks for the comment. 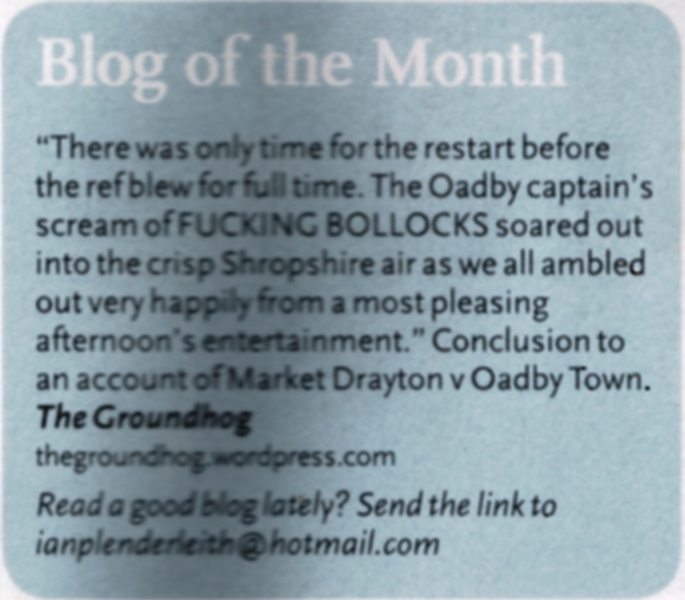 What more detail would you have liked; regarding the ground, the clubs or the day in general? Or in all areas?